Silsean is rarely mentioned or climbed without reference to its almost twin summit Moanbane. 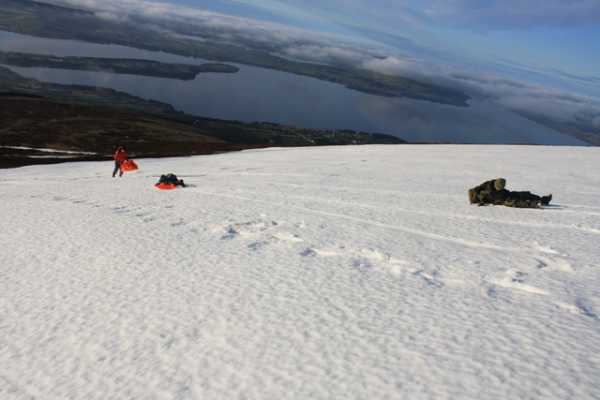 The two tops are the highest points of the area of mountain overlooking the hamlet of Ballyknockan to the east of the Blessington Lakes and Phoulaphuca Reservoir. There is about 1.5kms between the tops, and Silsean is the smaller by 5 metres. However Silsean has a summit cairn, while Moanbane makes do with a summit pond. The cairn on Silsean has recently been rebuilt by volunteers into a 3.5 foot high beehive from stone on the hill. 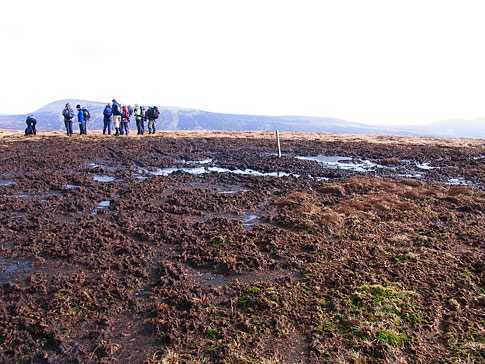 The same volunteers have attempted to repair damage caused by quad bikes by transplanting sods of bog to the scarred summit area. Silsean can be reached directly either from O00415 06643 A or O01141 07290 B. For a much longer walk start at the Black Hill car park at O04387 10862 C. Silsean offers great views across the Blessington Lakes, as well as south to Slievecorragh, Church Mountain, and Corriebracks. Ochill is the name for this summit area! What could be more Irish for St Patricks day than a ramble in our green hills!! I followed csds advice and approached Silsean from the Garryknock side. There is a forest track indicated on sheet 56 at O031036 D and this is where I parked up. There is the standard coillte yellow and black forest gate across this track and while the whole area looks less than frequently used, in the short space of time it took me to pull on my boots and pack the bag no less than two local farmers approached the gate, unlocked it, and entered the forest area to herd and feed sheep. There is really only room for perhaps two cars at this location and due care should be given not to block the gate. In hindsight there are also plenty of parking opportunities further along this road, in particular around the houses at the end of the road. So off I set along the forest track through the trees. I stuck with this track until it petered out as indicated on sheet 56. As you come to the end of the track there is a large turning circle and from here the track narrows and continues for perhaps another 50m. At this point a fence appears on your right hand side and inside it there is a faint track. While it does look fairly inhospitable just stick with it as it gradually opens up and is easy to walk along (fence should be with you on your right hand side the whole way). In no time at all you will be led onto open mountian and from here its a short forward skip to the summit. 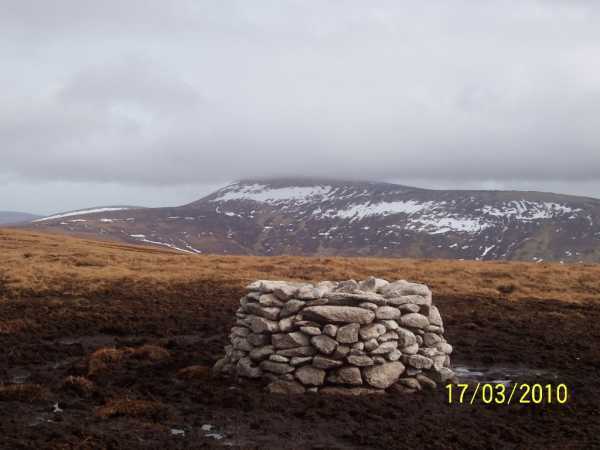 Just a quick note reference Darrenf's mention of the new Cairn on top of Silsean. Myself and some friends who live in Ballyknockan often walk in the general area of Silsean, Moanbane and Mullacleevaun. We were getting frustrated with the state of the summit of Silsean which had almost totally turned to a wet boggy mess because of the motorbikes and quad bikes which on an almost weekly basis would joyride all over this area. We started to build the Cairn using stone from about 100 to 150 metres away in a northerly direction. We carried a lot of the stone by hand but also used a stretcher. As well as building the cairn we also moved a lot of sods from lower on the hill to the summit in order to get some of the grass and other plants to take root and hopefully displace some of the water and make the ground "walkable" again. We hope to finish the cairn his summer. We intend on making a beehive shape so it should be at least a meter higher and should be seen from further away. Thankfully it seems that the biking has stopped since the signs went up for National Park at the forest gates above Ballyknockan. Picture from simon3 : Silsean wrecked by bikers. Picture: Silsean wrecked by bikers. This is the sad summit of Silsean as it is in March 2008. Compare this picture to that of csd's just four and a half years ago. The bikers have churned up the soil destroying the vegetation over the area beside the post you can see in both picures.